The SS420 Goniometer provides a wide range of testing capabilities. Its unique design integrates collimated optics with a diffraction grating spectrometer and a goniometer which allows for off angle measurements of luminance, chromaticity, contrast, etc. versus viewing angle. The system keeps the lens very close to the display which greatly reduces measurement errors such as veiling glare. This design also greatly reduces the space require for testing. With the ISO-3 option, the SS420 can perform all of the ISO9241-305 Unwanted Reflections measurements. This option includes three light sources, a reflectance standard and other hardware to to perform this rigorous test standard. The SS420 can be used on a stationary stand for fast single point measurements or use one of our positioners for automatic measurements at any location on the display under test. Photopic Analysis: ISO-Luminance vs. Viewing Angle, Luminance Uniformity, Contrast Ratio Plots, Gamma Plots, Backlight Characterization, Reflectance Measurements. Colorimetric Analysis: Chromaticity vs. Viewing Angle, Color Uniformity, Correlated Color Temperature, Color Gamut, CIE Chromaticity Plots. 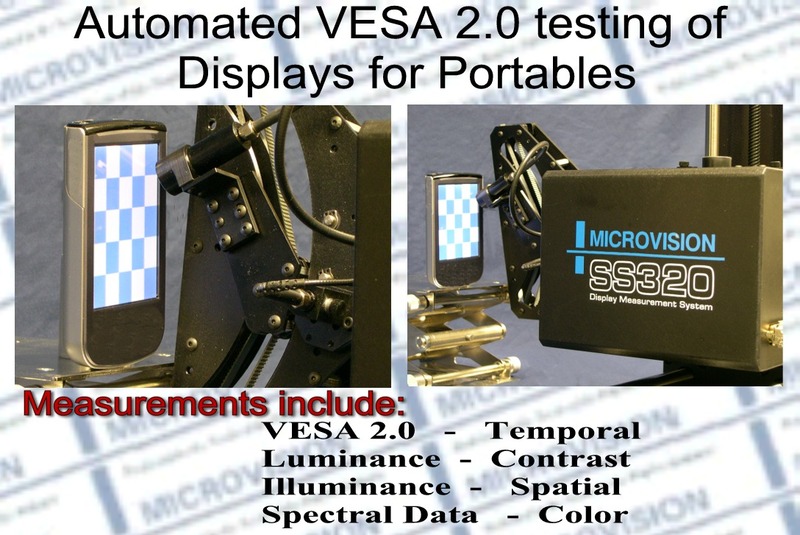 Automated Test Suites: ISO 9241-307, ISO 13406-2 Flat Panel Specification, TCO-03,05,06, VESA FPDM Basic Suite of Measurements.